About 150 volunteers served up meals to 500 people, some living in shelters or on the streets. 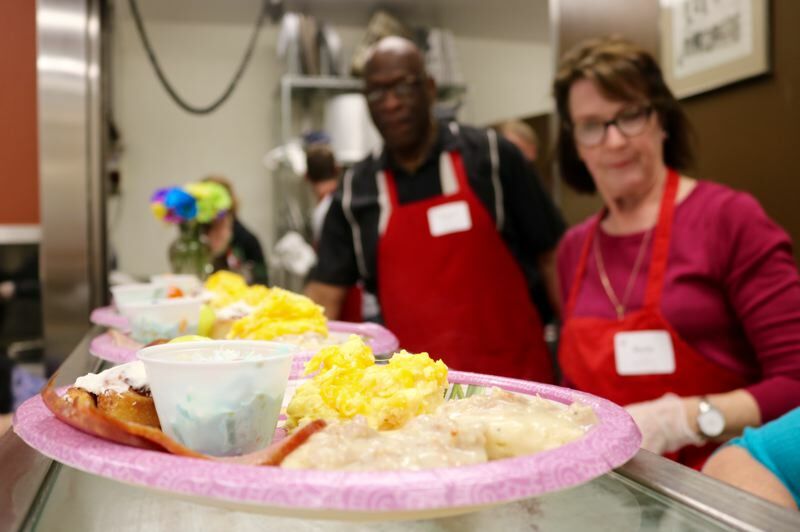 The smell of scrambled eggs wafted out of the Union Gospel Mission as Tracy Newton rolled up. What brought him here? His wheelchair, of course. "Bad sense of humor — it left me stumped," the 54-year-old joked, gesturing at his mobility device and empty pant legs. "It didn't stop me. It slowed me down." Newton said his legs were crushed by a five-ton forklift years ago. He's only been without a home for a few months. 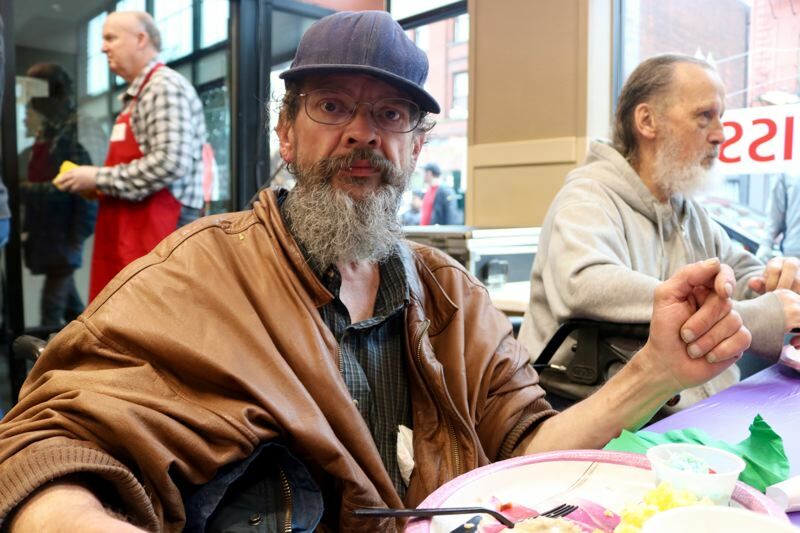 Raised in the Parkrose neighborhood, Newton was one of about 500 hungry folks who showed up for a hot meal and a warm welcome this Easter Sunday, April 1, in downtown Portland. About 150 volunteers served up a the hearty brunch of ham, scrambled eggs with cheese, biscuits with sausage gravy, ambrosia fruit salad, juice and coffee during the event that ran from 10 a.m. to 1 p.m.
Those who stopped by could also pick up a gift basket loaded with cold-weather gloves and gear, a fleece blanket and a personal hygiene kit with a toothbrush and toothpaste. 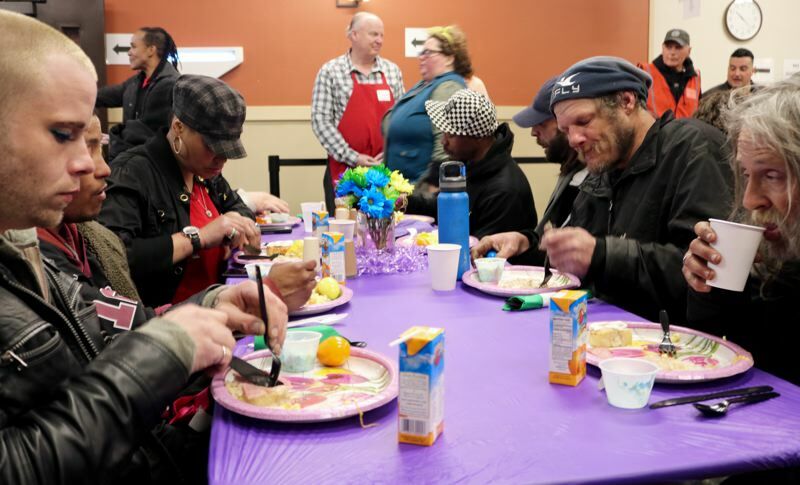 "(Some people) think they put themselves in this position," noted Curtis Bogan, a dedicated volunteer who spends at least 18 hours a week helping the homeless. "What I've come to find out is that that's far from the truth." 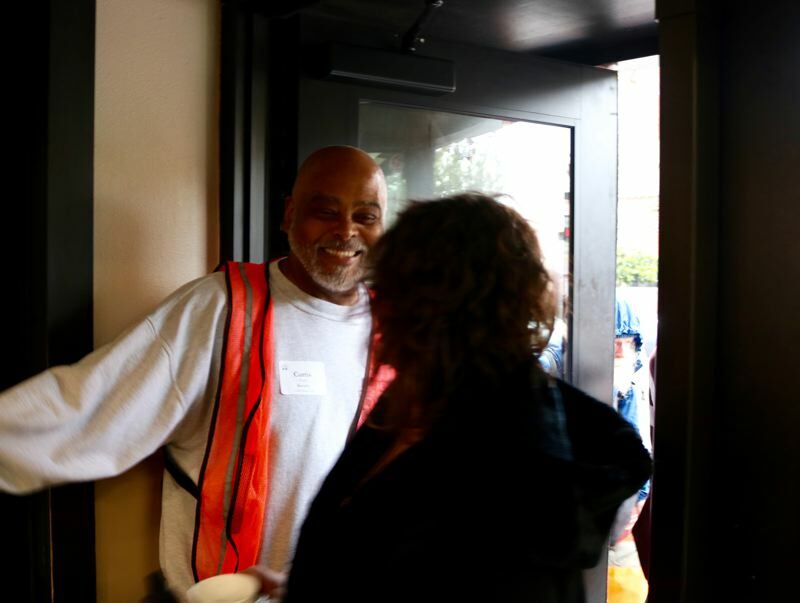 Bogan, a former Boeing employee from the Seattle area, was ushering guests inside as space opened up at the tables inside the Gospel Mission on Northwest 3rd Avenue. He also volunteers with the religious nonprofit's roving Search and Rescue team, which provides care to people living in tents and camps. "This isn't for everyone, but what I love seeing is the young volunteers," Bogan said. "It's all about giving back." 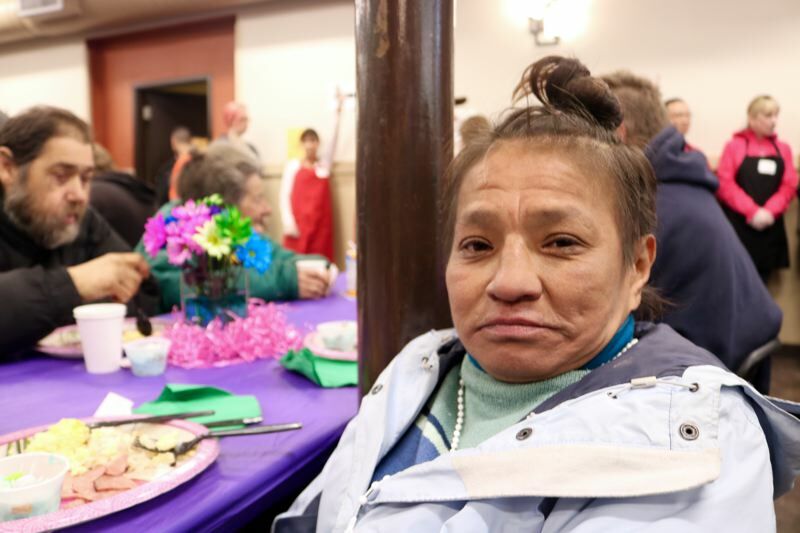 The table service was well appreciated by Kim Gonzalez, a native of Klamath Falls who lives in a nearby shelter. "Jesus brought me here. I read the Bible all the time and I talk to him all the time," the 47-year-old commented. "It's hard for me, looking for clothes and stuff. I wasn't born this way." Another guest, Jasmine Rosado, had just moved out of a shelter after spending a year on a waitlist for an apartment. There was only one problem — her new digs on the West Side didn't come with any pots or pans. A trained cellist who grew up in Lacey, Washington, Rosado studied at the University of Oregon and spent years working as a dancer in Portland before she became homeless. "I performed in Schnitzer Hall," the 39-year-old said. "I wound up trying to place myself in society." Margaret Murphy, a 15-year volunteer with Union Gospel Mission, told the Tribune that helping the down and out is "a humbling experience." "They're just like us, and we're not to judge. We're here to feed them and be their friend," she explained. "These folks wouldn't have anywhere to go during the holidays," added Stacy Kean, communications director for the Mission. "A lot of services are closed." 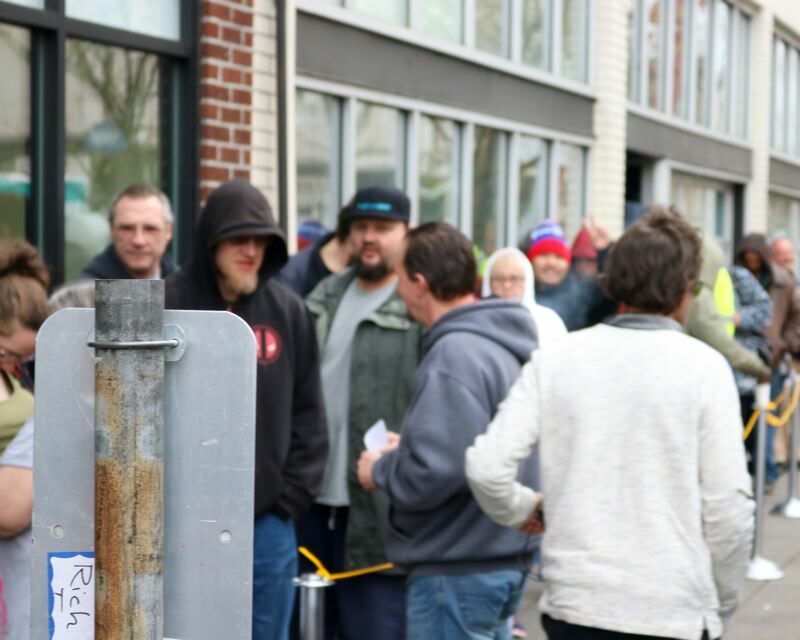 Union Gospel Mission distributes more than 200,000 meals each year, and also provides emergency cold-weather shelter and addiction services to those experiencing homelessness. The organization operates a thrift store in Tigard and opened a shelter for women and children in Beaverton in 2013.